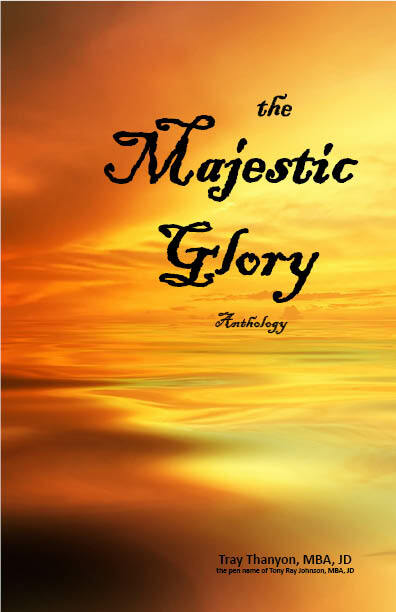 The Majestic Glory is an anthology with a united theme & purpose. The theme is the relationship between Yehovah (The Most High God) and His Beloved, known as The Bride of Christ, The Apple of His Eye, The True Church, The True Israel, The Elect, The Foreknown, The Third Temple, The Body of Christ, The House of God, The Household of Faith, His True Family, and His True Children. The end of this age is very close now. The Body of Christ is very sick, and it’s about to die, which is one of the signs of the very end. The True Church of God can never die, but the Professing Church is heavy laden with Tares & Goats. This anthology is a final message and call to The True Bride of Christ – Wake up! Be sober! Come out her that is Darkness! Repent & return to your First Love of your Bridegroom! For the Great & Glorious Kingdom of God is at hand! And this anthology is a message and call to every human soul – Hear the voice of the Greatest Lover of your soul! See His Great Work at the Cross! And know thyself: know that you are not a god, but are actually utterly corrupted throughout your entire inner being. And know the complete perfection & holiness of the One True & Most High God. Know that over all things, He is Love! Repent & be saved from His wrath which will surely come! This anthology is a telling of the greatest story of Love and the greatest gift ever given by a Lover to His Beloved – a gift that has not been given yet – the Majestic Glory!